On this date the 14th of February in 2001, our paternal grandmother, Mae Adams passed away in Ferriday, Concordia Parish, Louisiana. 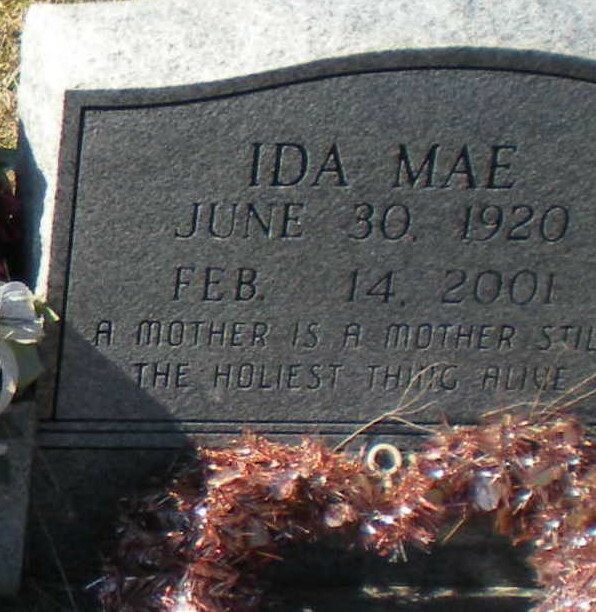 She was laid to rest next to her husband Floyd in Heard Cemetery in Manifest, Catahoula Parish, Louisiana. My fondest memories of Grandma was her wit, her love of Little Debbie snack cakes, her routine of washing her feet before she went to town, her sharp eye for picking up cans on the side of the road, her collection of rocks and her ability to smoke with no hands, though she never inhaled. Mrs. Adams was born June 30, 1920, in Drumright, Okla. She was a homemaker and a member of First Baptist Church of Ferriday. Mrs. Adams was preceded in death by her husband, Floyd B. Adams; three brothers, Raymond Burris, Charles Burris and James Burris. Survivors include three daughters, Sharron Kay Spivey of Marco Island, Fla., Brenda Mae Freeman of Long Beach and Linda Lee Tarver of Ferriday, La. ; four sons, Billy Joe Adams of Orlando, Fla., Floyd Dee Adams of Vidalia, Russell Lee Adams and Lyle Eugene Adams of Baton Rouge, La. ; four brothers, Johnny Burris of Drumright, Okla., Leroy Burris of Texas, Bucky Burris of Hobbs, N.M., and Ernest Burris of Drumright, Okla.; three sisters, Doris Wilborn of Ratcliff, Okla., Rosa Lee of Clausen, Okla., and Kathrine Hilton of Oklahoma; 16 grandchildren; and five great-grandchildren.